A weak cosmic infrared radiation field that reaches Earth from all directions contains not yet deciphered messages about the evolution of galaxies. Using first observations with the PACS Instrument on board ESA’s Herschel Space Telescope, scientists from the Max Planck Institute for Extraterrestrial Physics and other institutions have for the first time resolved more than half of this radiation into its constituting sources. Observations with Herschel open the road towards understanding the properties of these galaxies, and trace the dusty side of galaxy evolution. In the mid 1990’s, scientists analyzing data from NASA’s COBE spacecraft discovered faint radiation in the far-infrared part of the electromagnetic spectrum that reaches earth with the same intensity from all directions in space. 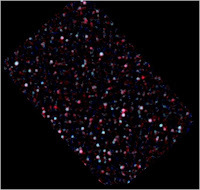 Immediately, they suspected it to be the aggregate emission of many distant galaxies in the early universe, releasing the same amount of energy in the far-infrared as reaches us in visible light from similarly distant galaxies. Whereas visible light tells us about the stars in galaxies, the far-infrared is emitted by cold dust that is hiding the newly formed stars. Identifying these surprisingly numerous dusty galaxies has proven difficult, though. Space telescopes are needed to detect far-infrared emission, because it is absorbed by the Earth’s atmosphere. Previous infrared space telescopes have detected far-infrared light from only the brightest of the galaxies forming this cosmic background. To glean any information about the fainter objects, astronomers had to rely on indirect evidence based on shorter wavelength radiation. ESA’s Herschel Space Observatory, launched in May 2009, is the largest space telescope ever built with a mirror diameter of 3.5m. Its PACS instrument is designed to take high-resolution images of the sky at far-infrared wavelengths, exactly where most of the cosmic infrared background emission is received. "After the check-out of our instrument, we were yearning to obtain the first deep far-infrared observations of the sky," says Albrecht Poglitsch, principal investigator of PACS. For a total of 30 hours in October, PACS has observed a small patch of sky in the constellation of Ursa Major, about a quarter of the size of the full moon. "Already in these first observations, we have resolved about 60% of the cosmic infrared background from this region of sky into individual well-detected sources," says Dieter Lutz from the consortium of scientists from five European institutes that have obtained the data. "And this is just the beginning. Yet more sensitive observations will follow soon, and we will be able to understand in detail the epoch of activity and the properties of the galaxies that produce the cosmic infrared background, now that we have pinned them down."